While we were walking down La Rambla on our way to the Gran Teatre del Liceu my eyes caught site of some very interesting packets of seeds for sale at one of the many sidewalk vendors. We both had quite a chuckle when we took a closer look at these unusual seed packets. However, be warned, these are rather X rated plants! 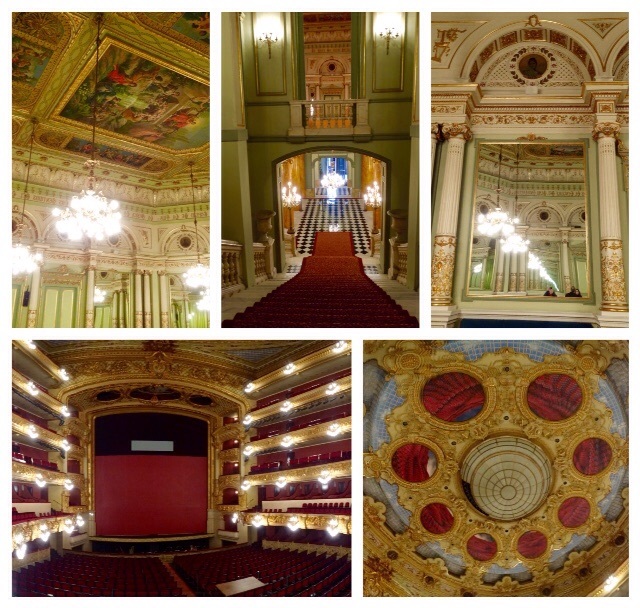 Barcelona’s Gran Teatre del Liceu was founded in 1847 and is located on La Ramba, which is the centermost boulevard in Barcelona. 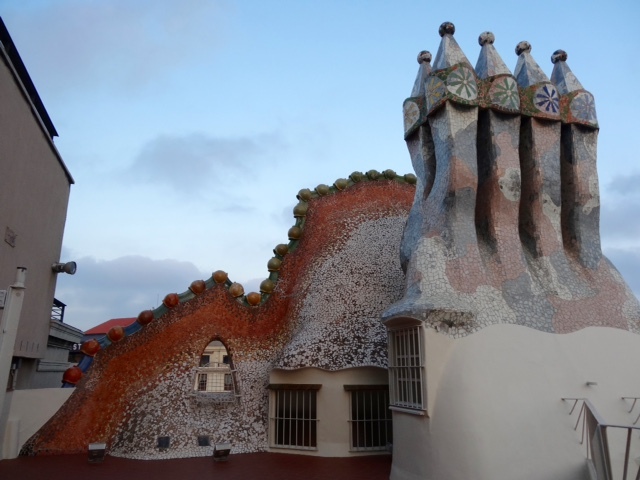 It is very popular with tourists and locals and is always crowded with people enjoying the sights. 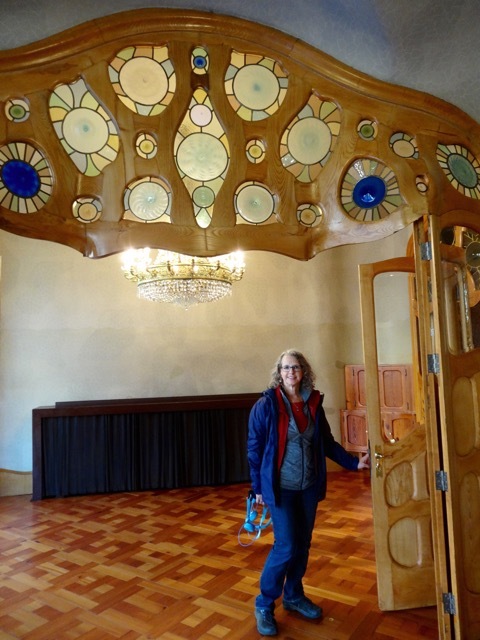 We have a short tour which includes the Vestibule, the Hall of Mirrors and the Auditorium. 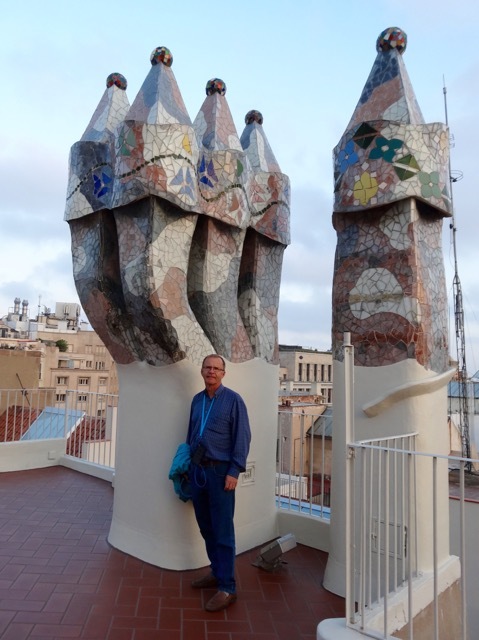 Our guide explains about the cheapest seats, in the galliner which translates literally to the “henroost” and we buy tickets for Monday night which will be our second last night in Barcelona. The tickets are only €15, we certainly cannot afford the €325 seats! Imagine paying $1,000 CAN for a night at the opera! This historic theatre has a very interesting history that includes two fires, the latest occurred in 1994 and completely destroyed the Auditorium. 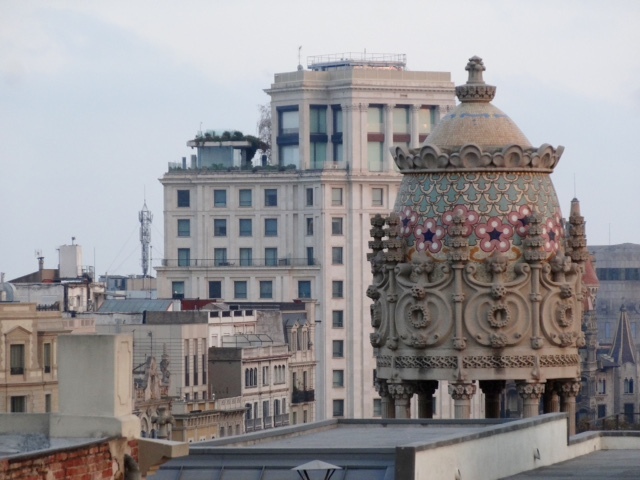 There is a good short video and more information about the Gran Teatre del Liceu here. 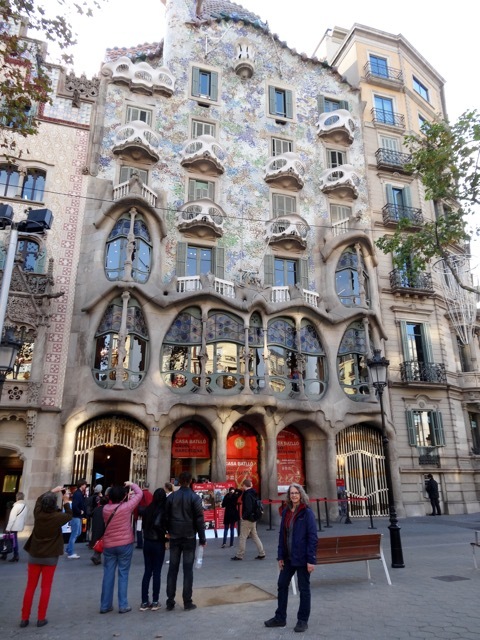 After our tour, we walk several blocks to one of Antoni Gaudi’s incredible buildings, Casa Batlló. We have tickets to go inside, €22.50 each, expensive, but we really enjoyed the visit. I took lots of pictures but then found this video that shows almost the same photos as those I took, so I will include the link to the video. Watching it made me feel like I was back there walking through the building. 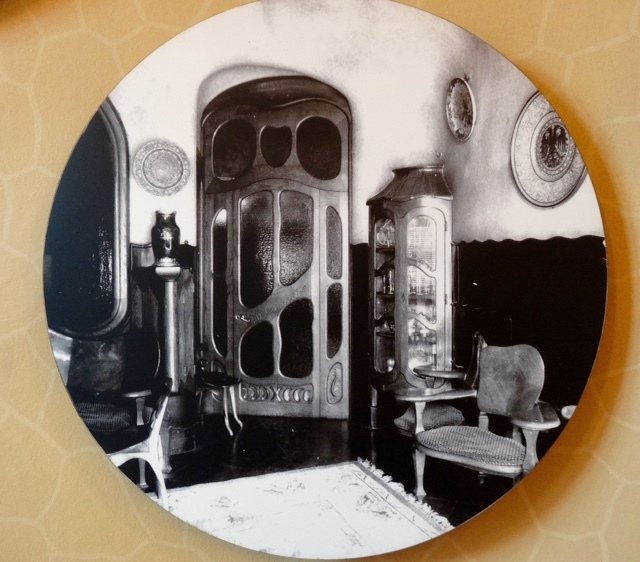 I have also included a second video which is a more fanciful walk through Casa Batlló, but it does give a sense of walking through the rooms. The little balcony at the very top of the building, it is the same one we stood on to take this photo. Did you notice that the building looks like it has been made from skulls and bones? The “skulls” are the balconies and the “bones” are supporting pillars. 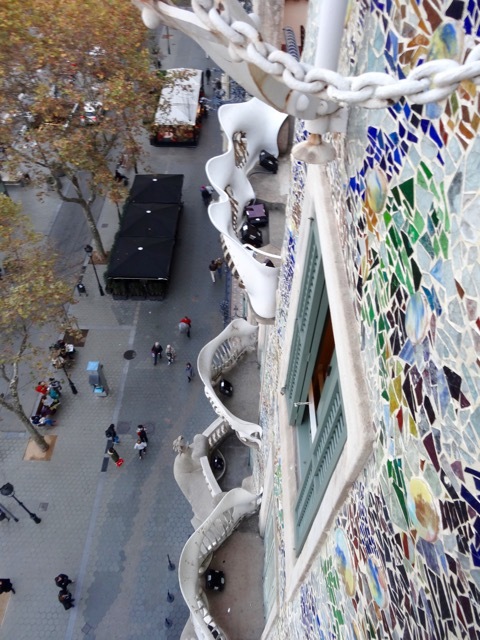 The building was designed by Gaudí for Josep Batlló, a wealthy aristocrat. 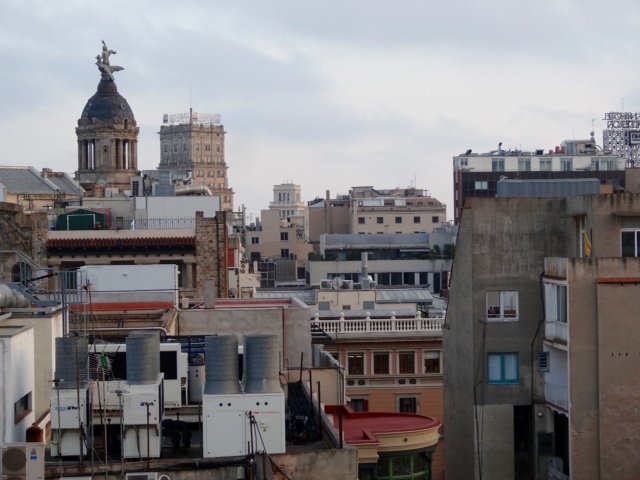 Señor Batlló lived in the lower two floors with his family and the upper floors were rented out as apartments. Today there are still private individuals living in the apartments. Imagine living in such building, and imagine having hundreds, or even thousands of people touring through your apartment building every day! There were several photos of the interior with its original furnishings, which I found very interesting. 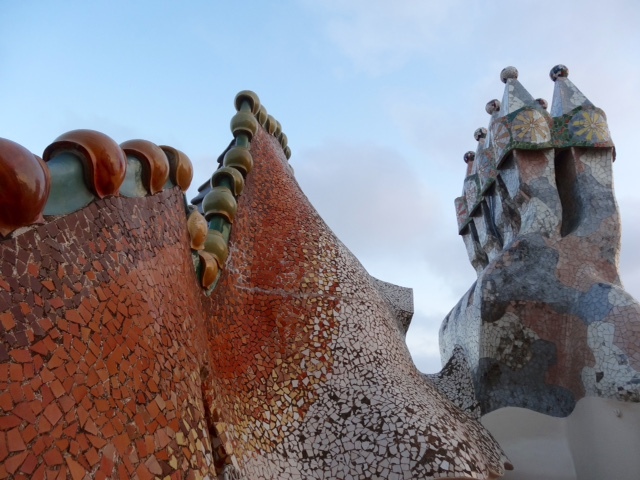 We climb up to the roof with its crazy chimneys and its famous ‘Dragon’ spine and great views over the neighbourhood rooftops. 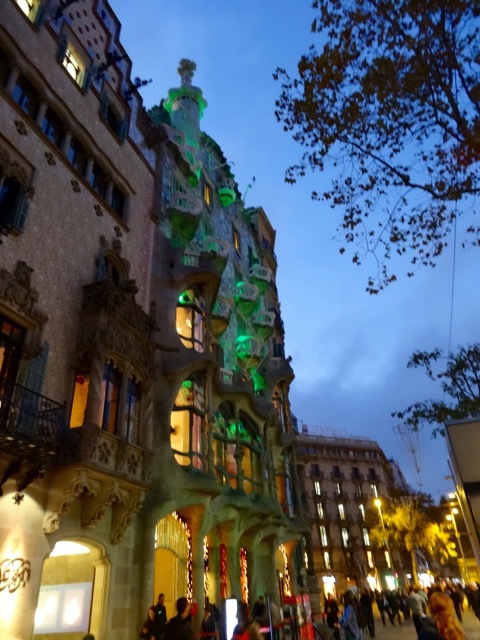 By the time we finally see everything it is getting dark outside and the Casa Batlló is illuminated with coloured lights. 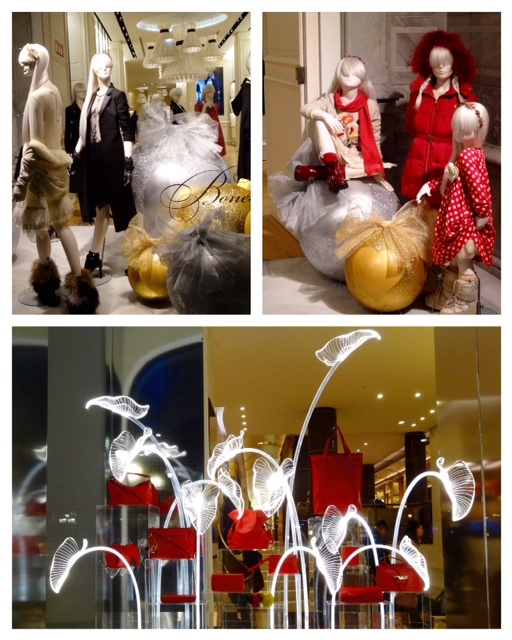 There are many interesting buildings on this street including several shops with beautiful window displays. 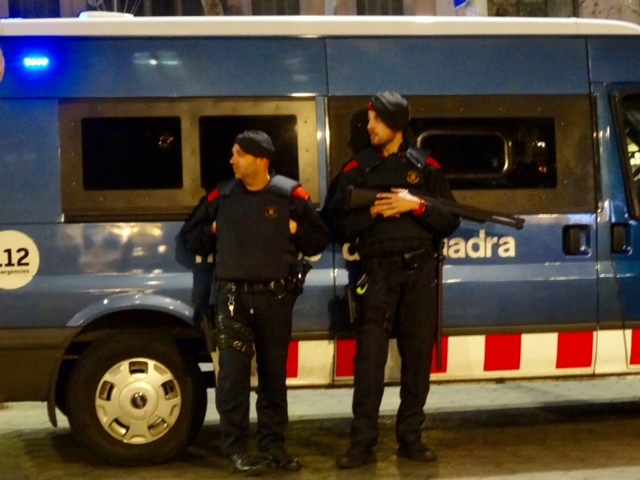 We also notice many more police on the streets than when we were in Barcelona in September, no doubt a result of the terrorist attacks in Paris. I don’t know if I will ever get used to seeing police with so many weapons. the picture is blurry as I zoomed in from a distance. I discovered they do not appreciate tourists taking photos! 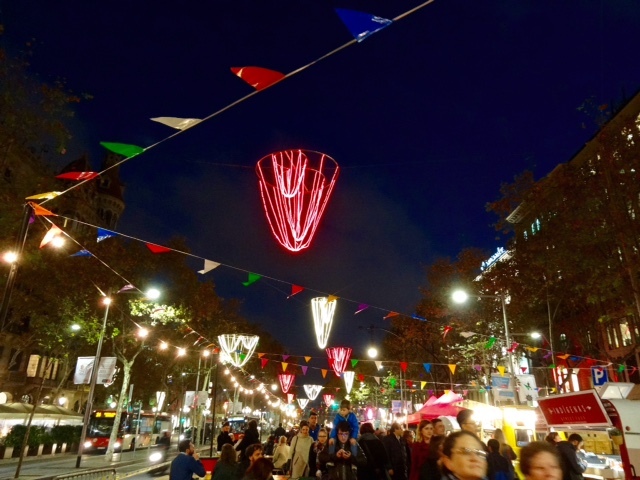 As we walk back towards La Rambla we come across an area with lots of food trucks so we have supper, enjoy the Christmas lights, and watch all the people. The streets are packed with hundreds of people out enjoying the evening. 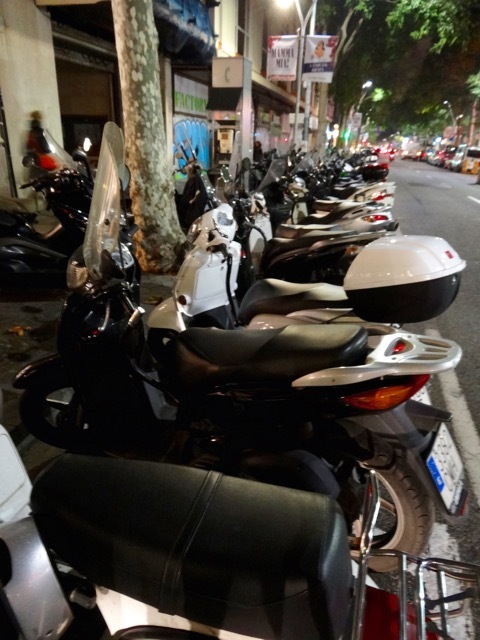 The side streets are lined with motorbikes and scooters, row after row of them. They are a very practical mode of transportation in a city that has next to no place to park cars. 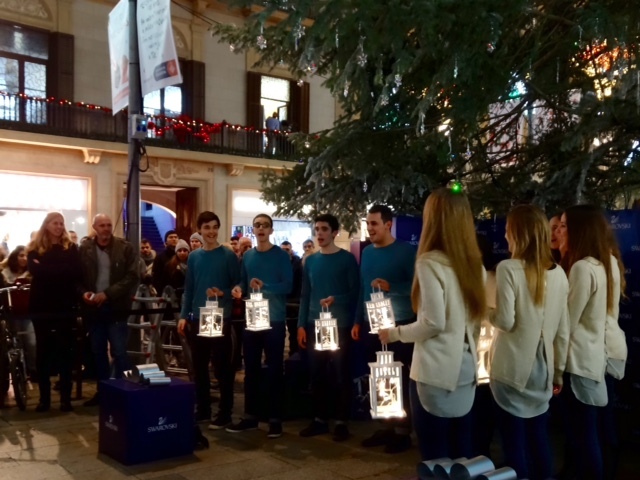 A crowd has gathered around a huge Christmas tree and before long a group of young carollers arrive and the lights are turned on. 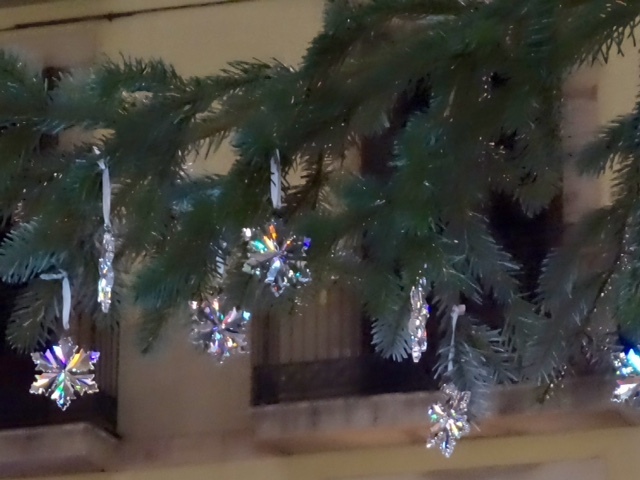 Hundreds of Swarovski crystal snowflakes decorate the tree! We stay to listen to the carollers and we both start feeling rather Christmassy! On the way home I had to stop in the Mobile World Centre as there were some great dinosaur displays, it seemed to have something to do with a new Samsung phone? 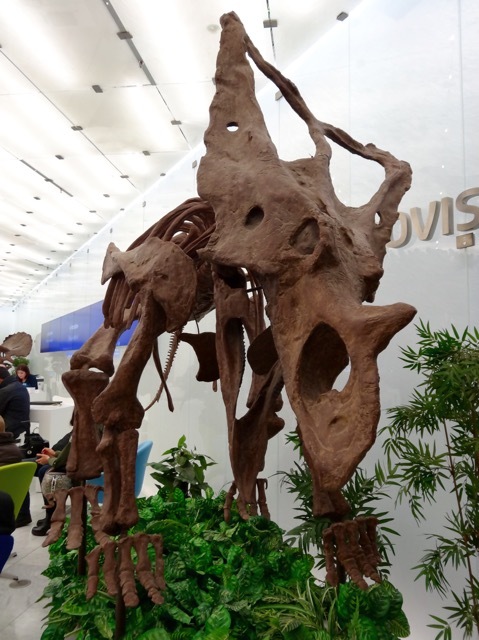 The centre is open to the public and showcases the latest technology, applications and innovations in the area of mobility but I was really only interested in the dinosaurs! 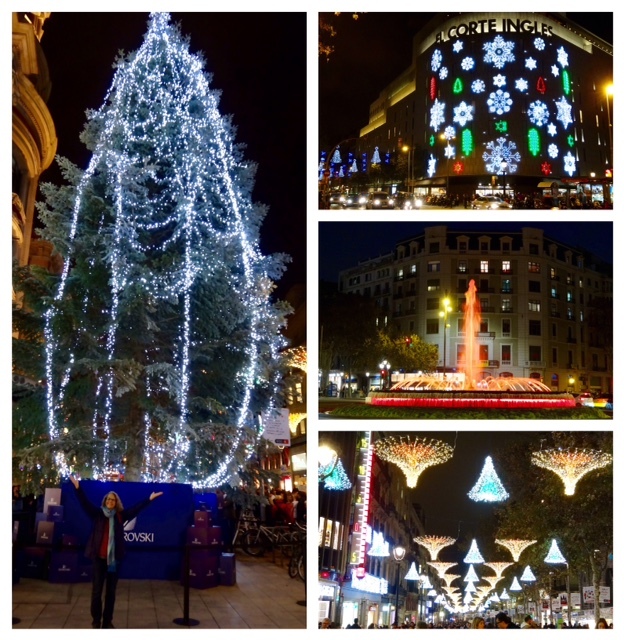 This entry was posted in Antoni Gaudi, Barcelona, Casa Batlló, Christmas Decorations, Historic Buildings, Liceu Theatre, Spain and tagged Antoni Gaudi, Barcelona, Casa Batlló, Liceu Theatre, People Watching, Shop Windows, Spain by Trudy. Bookmark the permalink. 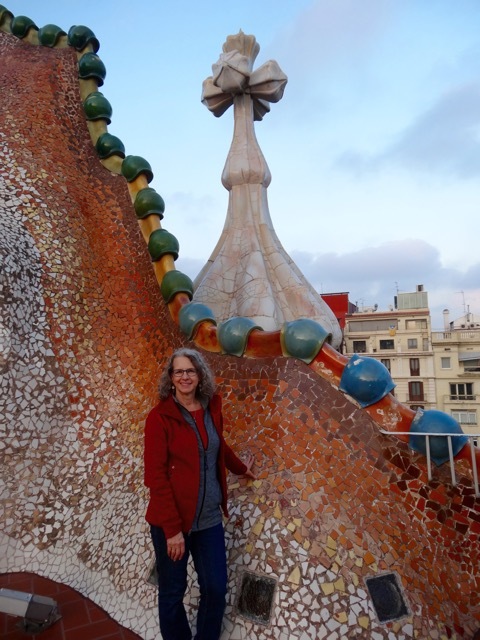 Just wanted to say how much I’m enjoying your travel blog! Spain and Portugal are on our list of places to travel so awesome to see through your and Bobs eyes. Great job writing and information ! Hi Jean, If you enjoy it even half as much as we did you will have a lovley time! Loved it all…especially the videos!